We use organic and permaculture practices. 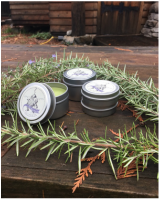 All herbs are grown on our little urban farm and lovingly crafted to create this multi-purpose, healing, healing salve. Massage therapists love it and it is also excellent for any topical skin condition such as dry skin, burns, psoriasis or eczema. Our inspiration for the name comes from the famous poem by Lewis Carroll...You Are Old Father William as it is excellent for loosening up stiff joints due to double infusion of fresh Arnica flowers! We use organic, natural beekeeping methods as per those taught by Ross Conrad in Natural Beekeeping:Organic Approaches to Modern Apiculture. 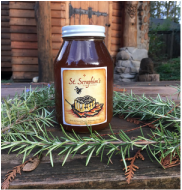 Our honey is always raw so as to retain the amazing health benefits of this golden goodness! Please enter the number of ointments you are purchasing. Once we receive your order we will contact you to let you know the cost of shipping to your destination.